Clown, red queen, or devil—this Halloween has you seeing red! We love a great costume (obviously), but do you know what we adore even more? The reveler who takes the time and care to do their makeup up right! Think about it: a clown without the carefully-painted face is just a zany dude in big shoes and a frizzy wig. The essence of clownhood is in the makeup! 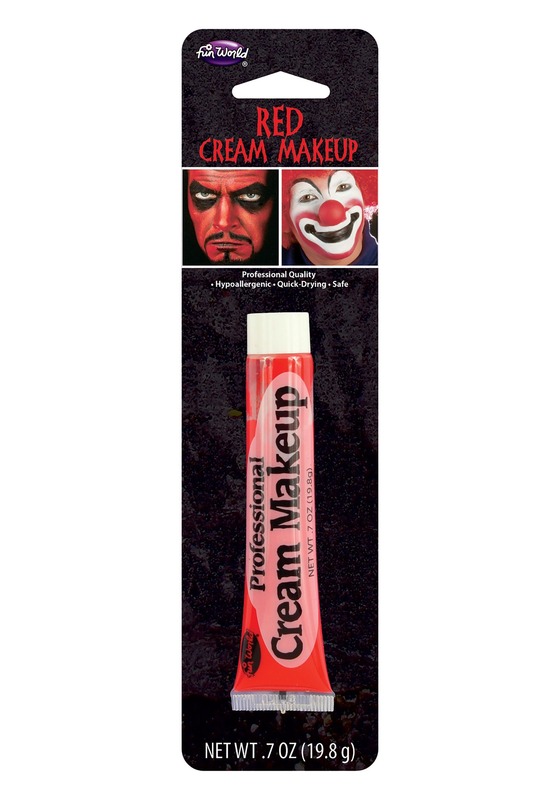 And there are many, many costumes that get their real oomph from a little tube like this Red Professional Cream Makeup. Don't believe us? Go ahead—go out dressed like a devil tonight, but without the red face; see how scary people think you are! This is a high-quality tube of product fit for the pros! It has a true red hue and is also hypoallergenic and quick-drying, perfect for last minute touch-ups in a flash. You can wash this makeup off easily with a little soap and water, though we don't know why you'd ever want to. We're pretty much wearing full face paint all the time! It makes for more amusing days and devil-may-care nights. Try it. So pick up a tube of this red makeup, along with any other colors you'll need to complete your look. There's no excuse for a clean face that doesn't match your costume—we know you're better than that!